If you have a set of stairs in your home then you may be thinking about whether to purchase a stair runner. Your stairs are high traffic areas and without a stair runner your wood stairs will see a lot of wear and tear. It is quite common to see indents in stairs which have developed over the years from constant use. It is a lot more economical to purchase a carpet runner to protect your stairs than to have the stairs fixed. If you have little ones in the house then a stair runner is a must. A carpet on your stairs will soften minor slips and falls. Anyone with teenagers in the house will know the feeling of heavy feet stomping up and down stairs. A carpet runner on the stairs will help to deaden the sound of heavy feet. 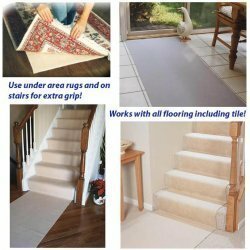 Ensure that you either have the stair runner installed professionally or follow the manufacturers instructions to ensure the runner is installed correctly.